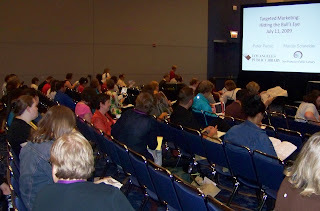 I'm finally getting back to blogging about marketing-related sessions at last week's American Library Association conference. By way of explanation, while I was in Chicago I put my full blogging power into the Infotoday Blog, run by library publisher Information Today, Inc., because that is my "real" (read: "paying") employer, and blogging for them was an assigned part of my job. The way we four Infotoday bloggers split up our coverage, I was still able to choose most of the marketing-related sessions I wanted to see. It was nice working with a team where each member could concentrate on his or her own specialty, and we worked hard to write substantive posts in order to help all those who couldn't attend in person. So if you haven't looked at any of the coverage there, I urge you to check it out. I won't be repeating all of the marketing / promo stuff I already wrote there, but rather referring back to some of it and adding a few extra thoughts and photos here. The first session I attended on Saturday was on Targeted Marketing. I was thrilled to see a talk devoted to that topic, and I obviously wasn't alone because the room was packed and people were sitting on the floor by the time it began. The session wasn't about how to look at your user base and divide them into target groups. It was more about how to plan a campaign (set goals, get buy-in, evaluate afterward -- the usual stuff) to tell folks that the library wasn't what it used to be. Then when it came time to create different advertisements to appeal to different target markets, both libraries involved in this session were lucky enough to have gotten pro-bono work from PR company Ogilvy. Great for them, but they couldn't speak much about that part of the campaign. Also, neither campaign had yet been completed or evaluated, so they couldn't talk about those vital aspects. * Libraries are known for Information. This need is also filled by Google. * Libraries are known for Reading. This need is also filled by Barnes & Noble. * Libraries are known as Cultural Centers. This need is also filled by museums. * Libraries are know as Community Centers. This need is also filled by Starbucks. However, he pointed out, the library "is uniquely positioned at the nexus of all four needs," he said, circling the intersection at the middle of the plus sign. So he encouraged listeners to "promote the nexus." Nice thought! The second session I went to on Saturday was about Partnering with Service Organizations, something that I always recommend and often speak about. I found the 2 hours incredibly worthwhile, and encourage you to read the full post here. Each panelist shared specific info about an organization the she belongs to, so listeners learned a lot about the Rotary, Lions, Kiwanis, and Altrusa, along with a bit from the moderator about Soroptimists International. (I had never even heard of the last two.) Everyone encouraged librarians not to hesitate to ask for funding, explaining that these organizations "have money they have to give away" for small things on a regular basis. These dollars could be yours, just for asking! All the speakers encouraged librarians to join these groups, not only to have great professional networking opportunities, but also to find personal satisfaction within orgs that share some of the same values as libraries have. It does often cost money to belong, but oftentimes your library employer will foot the bill especially after you demonstrate the value of membership.